Blog Quick Quotes: School Days with Dana! Dana here today sharing a layout that I created with the NEW "Pattern Perfect" line, a Back to School Collection from Quick Quotes. Just like the name "Pattern Perfect" suggests, this line includes all of my favorite patterns perfect for school themed projects like stars, apples, rulers, books, the alphabet and numbers. I had yet to scrap my daughter's school photo, so my procrastination really paid off! I cut several fun shapes and letters from the patterned papers for this embellishment cluster. The green "bow" on the bottom is actually an "&" symbol that I turned on its side. I added my daughter's grade to the top of the cluster with a Pattern Perfect Sticker. One of the Pattern Perfect Chipboard Die-Cuts fit perfectly in the open space on this book binding. 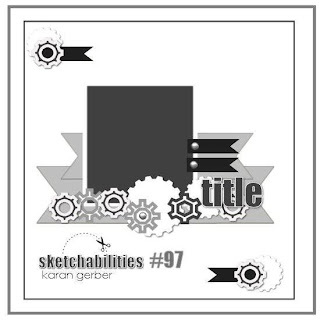 I also added chipboard photo corners and a chipboard title to my page. I based this layout on Sketchabilities Sketch #97. Love what you did with the ampersand! Very nice design! And a beautiful girl! Love this Dana! fabulous layering!! What a little cutie you have!! Love all the little details you added to make this layout spectacular!